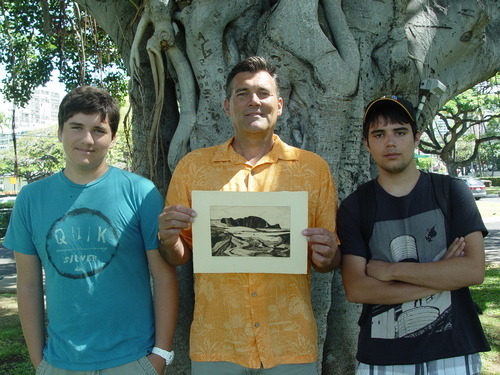 Last week the grandson of 1948 Gift Print artist Donald Hardman stopped by the Honolulu Printmakers with his family to say hello. Aaron Austin, wife Becky, and sons Alec and Glenn, who live in Japan, were here on vacation, but also to find out more about Hardman, whom Aaron never met. Fortunately I was able to find Hardman’s exquisite drypoint Last Light still residing in our archives (many Gift Prints from that era are gone), and the family was excited to be able to spend some time with something they had previously only seen reproduced online. Coincidentally, HMAS intaglio instructor AJ Feducia was teaching in the studio during their visit, and the family was invited to drop in and watch how an intaglio print was made. The family seemed quite moved by the whole visit, and I sent them on their way with some complimentary 75th Anniversary Gift Print catalogs. Aaron, who studied art in college, told me when he was leaving that he was very inspired and had resolved to seek out educational opportunities in printmaking in Japan. This is a gratifying example of the value of our organization’s history and longevity, and how those can facilitate our mission of promoting printmaking and growing sustainable creative communities.